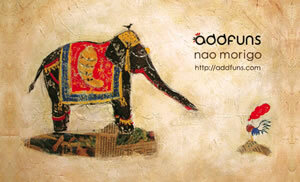 "addfuns" want to present add a lot of fun to you from Creative of nao morigo! January 2010 Winning, Prize of "Ikka"
"Sogen Shodo exhibition"　Prize of Nika"Sogen Shodo exhibition"
January 2007-2009 (3times each year) Winning, Prize of "Nika"
"Sogen Shodo exhibition"　Prize of Nika "Sogen Shodo exhibition"
Publicly chosen exhibition at Ann Arbor art center in Michigan in USA. 2008 Start "addfuns" which means " ADD a lot of FUN(S) to your life.". I'm painting several types of series now. The rooster is the subject of the piece and represents my mind. The landscape which I have painted is his (the rooster) view of the places in the world where I have traveled. I used local newspaper of each places I have visited. Therefore I can express what was happening at the moment as background for each city.